Why have four of the magazine industry's best-known editors stepped down in the past week? It's not a coordinated exodus. But it's not entirely a coincidence either. The transition from the print age to the digital age has been grueling. Major publishers have been making hard choices about cuts. And analysts expect even more cost-cutting in the near future. Of course, that's only a partial explanation. The editors all have specific personal and professional reasons for leaving. Some of them have indicated that they have new jobs penciled in, if not fully lined up. But the leadership changes -- affecting all three of the biggest U.S. magazine publishers -- are coming at a complex time. 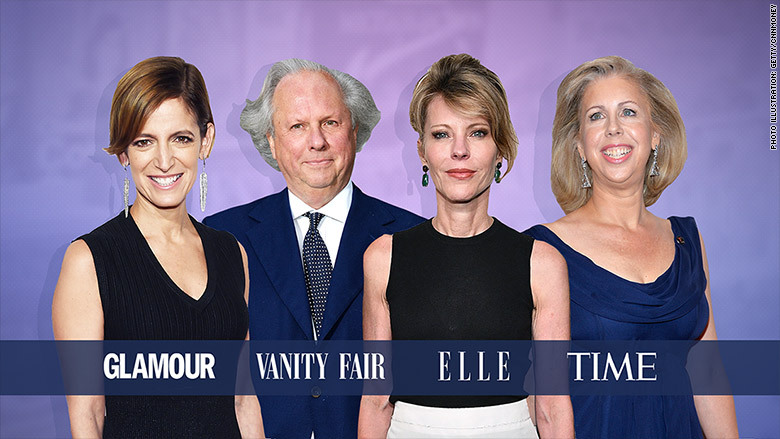 Graydon Carter, the legendary editor of Vanity Fair magazine, was the first to announce his decision. "I want to leave while the magazine is on top," he told The New York Times last week. Another factor was the financial health of the magazine's parent company Condé Nast. "Condé Nast is looking to make major cuts," and that was "a factor that contributed to Carter's decision to depart," a Condé insider told CNNMoney. Condé has not yet named his replacement. The publisher's arch rival, Hearst Magazines, is under pressure as well. On Monday, Robbie Myers stepped down from Elle magazine. Nina Garcia will succeed her. And on Thursday, Cindi Leive, the editor in chief at another Condé title, Glamour, said she was moving on, too. No word yet on a replacement. There are changes afoot at Time Inc. too. Time editor in chief Nancy Gibbs announced her exit on Tuesday night. Time said on Thursday that Edward Felsenthal would succeed her. Referencing the other recent announcements, Leive told The Times, "That's a pretty nice outgoing class to be in, I'll take it. We can all hang out in the corner booth somewhere." Taken together with last week's sale of the New York Daily News to Tronc, it has the feel of an end-of-a-very-specific-era of Manhattan media. It almost goes without saying that longtime editors are expensive, and their replacements will almost surely have lower salaries. But it's about more than that -- running a magazine that's growing is more fun than running a magazine that's shrinking in print and trying to expand on the web. All four editors have been in the business for decades and fondly remember "the golden age," one publishing industry executive pointed out. There have been drastic changes to budgets, bottom lines and expectations, and "that takes a toll," the executive said. Longtime editor Daniel Gross‏ echoed this in a tweet on Thursday: "Why are veteran magazine editors quitting? Having to cut staff/budget 20% year after year takes a toll." Time Inc., the biggest U.S. magazine publisher in terms of total revenue, announced another round of cuts just three months ago. To be clear, the editors haven't specifically cited cost-cutting in their announcements. And some of the other reasons for the seemingly sudden exodus are more mundane. For example: The summer vacation season. At least one of the editors started to contemplate a change in July, got serious about it in August, and firmed up the plans after Labor Day. But it's hard not to see something deeper in the various decisions -- a conclusion that there are even more hard times ahead for publishers. The magazine industry "has been pummeled non-stop for the last decade," Folio's Tony Silber wrote Wednesday. "The industry is adaptive and resilient, for sure. Scores of its brands are the most influential and still-powerful media brands in the country, but the economics are in turmoil and the media industry seems always a step behind the innovations of the technology/media hybrids, especially the duopoly of Facebook and Google." No editor, no matter how talented, can change that. Vogue editor in chief Anna Wintour even acknowledged this in an interview with WWD this week. "Did you know we'd be living in an Instagram age or a Snapchat age five years ago?" she asked. "I mean, I'm not an engineer. I don't work in Silicon Valley. I'm thrilled there are people who can create these amazing channels and our job is to think how we can best use them to create the best content that we possibly, possibly can."